Yellowstone Treasures: Home / Nuggets / Where Are All the Bears? For more than fifty years, visitors to Yellowstone could rely on encountering black bears along the roads. “Bear jams” were as common as eruptions of Old Faithful Geyser. Now you have to be lucky to see a bear, even if you stay a week. 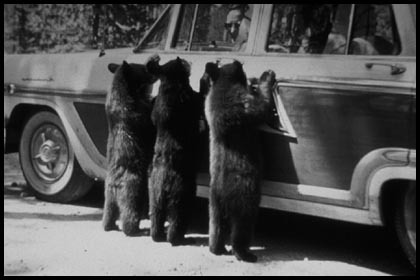 Bears had become increasingly bold with tourists between 1915, when cars first entered the park, and 1970. They were never tame, though, and as many as fifty people would be injured each season, leading to many “problem bears” having to be killed by the park service. To correct the situation, the park changed its policies, closing dumps where black bears had fed, using bear-proof garbage cans, insisting on secure food storage by campers and backcountry hikers, cautioning people against feeding bears, and fining offenders. With these measures, a dramatic reduction of bear/human confrontations ensued. Now there are very few incidents, and the bear population is doing very well, but mostly out of sight of visitors. You may still see bears occasionally, but rarely near the roads. The best area to spot them at relatively short distances from the roads is around Tower-Roosevelt Junction. Also keep your eyes open for them in the Mammoth Hot Springs area and between Old Faithful and Madison. CREDITS: The photo of black bears is displayed courtesy of the US Department of the Interior, National Park Service, Yellowstone National Park. IN THE GUIDEBOOK: Find out more about both black and grizzly bears in the “Living Things” chapter of Yellowstone Treasures.